This 2019 Ford Super Duty F-450 DRW LARIAT is offered to you for sale by Cypress Motors. This Ford includes: ALL-WEATHER FLOOR MATS Floor Mats UPFITTER SWITCHES CHROME PACKAGE Running Boards/Side Steps CAMPER PACKAGE 5TH WHEEL/GOOSENECK HITCH PREP PACKAGE BLACK, LEATHER HEATED/COOLED LUXURY CAPTAIN'S CHAIRS Heated Rear Seat(s) Cooled Front Seat(s) Woodgrain Interior Trim Heated Front Seat(s) Leather Seats Bucket Seats LARIAT ULTIMATE PACKAGE Keyless Start Remote Engine Start Navigation System Heated Steering Wheel Adjustable Steering Wheel Satellite Radio Power Door Locks Keyless Entry LOWER ACCENT TWO-TONE PAINT STONE GREY REAR CHMSL CAMERA TRANSMISSION: TORQSHIFT 6-SPEED AUTOMATIC Transmission w/Dual Shift Mode A/T 6-Speed A/T TIRES: 225/70RX19.5G BSW TRACTION (STD) ENGINE: 6.7L 4V OHV POWER STROKE V8 TURBO DIESEL B20 Diesel Fuel 8 Cylinder Engine Turbocharged ORDER CODE 678A WHITE PLATINUM TRI-COAT METALLIC *Note - For third party subscriptions or services, please contact the dealer for more information. * There's a level of quality and refinement in this Ford Super Duty F-450 DRW that you won't find in your average vehicle. When Ford created this vehicle with 4 wheel drive, they immediately enhanced the performance ability. Easily switch between two and four wheel drive to take advantage of the improved steering and superior acceleration. 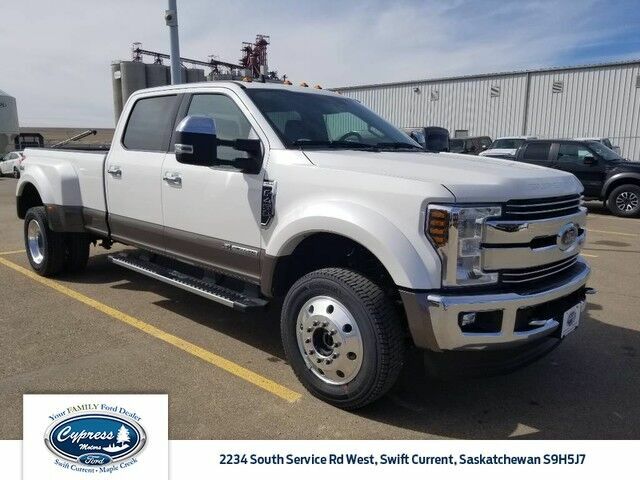 Marked by excellent quality and features with unmistakable refined leather interior that added value and class to the Ford Super Duty F-450 DRW Enjoy the drive without worrying about directions thanks to the built-in navigation system.